Take your next journey and wrap it around you. 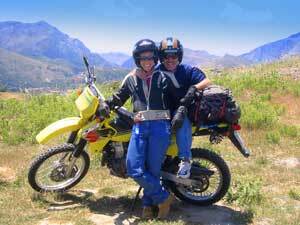 Be adventurous and explore on a motorcycle! Few people travel with a twist of the throttle. Even fewer go outside the country to ride foreign roads. A trip through the ancient history-filled island of Crete is simply magical! I find traveling by motorcycle to be a unique and unpredictable experience. Unlike other modes of transportation, it demands conservative packing and active participation. In exchange, it completely envelopes you in the surrounding sights, sounds, and smells. There is simply no escape! So trade your suitcase for a backpack and forfeit your climate-controlled environment to Mother Nature. Crete is a magical place, with stunning high mountains that dramatically plunge down to impossibly blue waters. The island roads spin dizzyingly from hilltop to valley and etch the coastline in a route that transports you to remote villages where time stands still. The landscape varies richly from white sandy beaches to rocky cliffs pitted with caves. Cypress- and pine-covered mountains give way to scrubby high desert plateaus. Aromatic herbs grow rampantly, and olive trees carpet the hills in a maze of ancient terracing. In the midst of all this, herds of sheep and goats sporting bells contentedly wander the rocky hillsides. 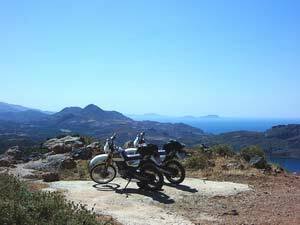 Crete offers a network of over 6,000 miles of paved roads and dirt tracks — a motorcyclist dream! Equipped with nothing more than a map and a backpack, I spent a nomadic week roaming western Crete on a dual-sport motorcycle. I embarked on an overnight ANEK ferry from Piraeus (the major port near Athens) to the mid-island city of Rethymno, where I rented a bike from Greenways and headed southbound into the unspoiled countryside. Greenways also offers car rentals and organized motorcycle tours, and while their employees are extremely knowledgeable and hospitable, I opted to independently explore on two wheels. The north side Crete is relatively flat, with five major port cities — Chania, Rethymno, Iraklion, Agios, Nikolaos, and Sitia — all connected by a straight, modern freeway (E75). 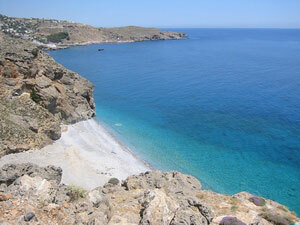 As a result, the northern coast offers the most accessible beaches on Crete, making it a popular tourist destination, especially in the heat of summer. In contrast, access to the southern portion of the island is more limited and challenging due to the rugged mountain terrain and consequent lack of roads. In fact, some villages on the southern coast are only accessible by boat or hiking trail. The main roads in western Crete are paved and in good condition. However, with the exception of the major highway, roads have no street names, merely signs pointing in the direction of towns and villages. Once you venture off the beaten path, routes are rarely more than a single unmarked lane. They become extremely steep, narrow, windy, and not particularly well maintained. Traffic is minimal, but does exist in both directions—a fact worth remembering! A tangled web of unsurfaced roads spans the forgotten portions of the island. In some cases, these roads connect more civilized routes together; on other occasions, they dead-end at mountain peaks or beaches. Every dirt road I traveled was passable on a dual-sport motorcycle. Some routes required more effort than others did, but all were as depicted on my map. Without a doubt, the best map of Crete is the rip-proof waterproof one published by Rough Guides. Not only is this the most durable map available (important criterion on a motorcycle), I found it to be the most comprehensive and reliable. The companion travel guide is also available and highly recommended. In an entire week of desperately trying to lose myself, only once did I find myself on a dirt trail that was off the map. The map depicted every other road or trail, no matter how remote. In my travels throughout western Crete, I wandered without a set itinerary or advance reservations. I managed to bypass most of the tourist traps and discover unique alternatives. Go beyond the beaten path and make the trek to far-flung places where the simple life lives on. 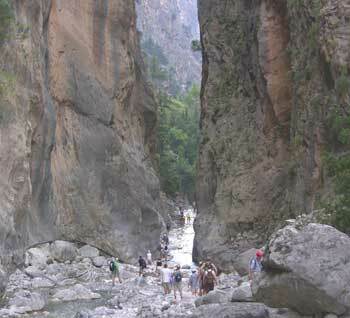 The magnificent Samaria Gorge, supposedly the longest in all of Europe, is a popular landmark, well traveled by day-trippers and hikers. There are no roads through this national treasure, so if you want to ride through the similar territory, check out other island gorges like the rugged, narrow Kourtaliotiko Gorge, which runs from north to south between the town of Koxare and Preveli Beach. At the bottom of the gorge, the Megapotamos River forms five pools and a waterfall before emptying into the clear blue Libyan Sea at Preveli Beach. Past Frangokastello, on the southern coast of Crete, discover the picturesque harbor town of Hora Sfakion. This amazing road out of Hora Sfakion curls and twists up an impressive 8-mile climb to the Anopolis plateau, 2000 feet above sea level. On every corner, a Kri-kri (Cretan goat) perches nonchalantly with a bell around his neck, and while the rocky crevices carefully camouflage him, the musical necklace blatantly exposes him. Crete offers endless scenic vistas. In the town of Anopoli, Eva Kopassis has gained an outstanding reputation for her traditional regional cooking at the taverna called O Platanos. 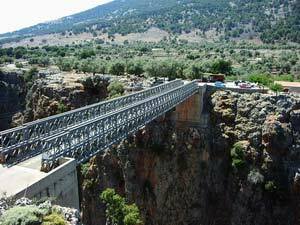 Beyond Anopoli lies the ancient settlement of Aradena where a 450-foot-high wooden-plank bridge spans the Aradena Gorge. This bridge, one of the highest in Europe, is the site of seasonal bungee jumping. The road beyond Anopoli ends at Agios Ioannis; only hiking trails lead back to the coast. 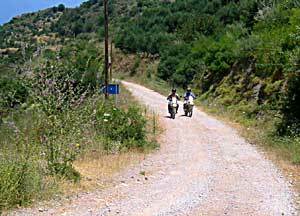 Although dead ends are always disappointing, the road from Hora Sfakion to Agios Ioannis is worth riding every mile—in both directions. North out of Hora Sfakion, a beautiful route snakes through the wind-torn Imbros gorge. At Askifou Sfakia, an enthusiastic Cretan named Andreas George Hatzidakis nurtures a war museum. As a child, Hatzidakis was wounded by German Stuka dive bombers; today, he proudly points to the indentation in his head where he took the hit. His private collection of wartime memorabilia is staggering, but it pales compared to his passionate verbal chronicle of military history and personal experiences. Dramatic chasms surround the picturesque high mountain village of Lakki, nestled between Fournes and Omalos the along the tortuously twisty road that leads to the Samaria Gorge entrance. In the center of town, a striking monument stabs skyward from a cantilevered deck with stunning views of the valley below. The island has an excellent network of roads. At the town hub—Nikolas Restaurant, Kafe, & Bar—resident old men interminably drink Nescafé, play backgammon, and fidget with their komboloi, or worry beads. Nikolas does not take credit cards, but not to worry. He fed me and gave me a comfortable room for the night before sending me off on a two-hour ATM run the next morning. This refreshing dose of trust and hospitality aptly restores one’s faith in humanity. Makings of a Greek frappe. For me, motorcycling meals are in a class of their own. First off, it is hard to go biking on a full stomach. Secondly, it is important to keep your mind clear and your wits nearby. So, during the riding day, large meals are out and coffee is in. But, at the end of the day, there is nothing better than a tall drink and a hot meal. I love sitting back and reflecting on the day’s ride over a cool cocktail and then planning the next day over a long, drawn-out dinner. The Mediterranean diet fits this dining mode like a glove. Greeks typically don’t eat breakfast. When they do, it is small and simple: yogurt with honey, cheese-filled pastries (sfakianes pites), or bread with jam. And coffee, of course. From young teenagers to old men, nearly everyone on Crete drinks coffee in some shape or form: Greek coffee (a miniature brew that includes the grounds, which are not meant to be drunk), Nescafé (instant coffee), or my personal favorite, the famous Nescafé frappé (a frothy iced blend of Nescafé, milk, and sugar). It’s easy to get a pick-me-up any time of day. After hours of riding in the island heat, few sights are more welcome than the hand-painted sign that reads “Taverna.” Vine-covered patios provide shade and rest for the weary traveler. Each establishment offers local food, made by hand and fresh from an intimate kitchen. In the smaller villages, menus are rare or nonexistent. The tavernas serve whatever was prepared that day in the kitchen. Your waiter will serve homemade bread (psomí) by request only, accompanied by an intense yellow olive oil that rarely leaves the island. Each taverna makes its own olive oil, olives, and regional cheese, so a savory sampling at each stop is mandatory. I rented my bike from Greenways., which also offers guided motorcycle tours. Because the heat can be oppressive, lunch fare is often fresh and light. Greek salad (also called village salad or horiatiki salata) is common in tavernas. Greeks typically eat it as a side, but they will serve it as a meal. (vine leaves stuffed with rice and seasoned with olive oil and lemon juice) and tsatziki (the refreshing yogurt, garlic, and cucumber dip) are worth trying repeatedly because each version is homemade from an original recipe. 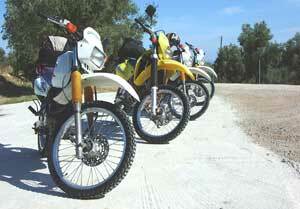 The day’s ride typically ends in some secluded village, deep in the Cretan countryside. No matter how tiny or remote, each locale has at least one taverna with a sign that reads “Rooms to Let.” The accommodations are immaculate and the furnishings are simple. Visits to these tavernas are inviting, relaxing, and downright addicting. Plus, they serve meals! The limited selection of beer on Crete includes Heineken and Amstel (both from the Netherlands) and the Greek beers Mythos and Zakos. Practically every establishment serves wine, occasionally by the bottle. Most often, the wine is homemade and served in a small glass carafe or aluminum pitcher. 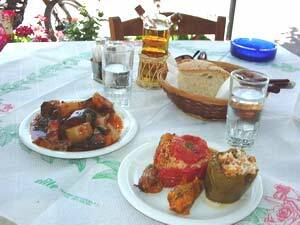 Come dinnertime, Cretan specialties may include things like yemistá (stuffed tomatoes, peppers, and zucchini blossoms), pastitsio (macaroni with minced meat and béchamel), and moussaka (layers of potatoes, aubergines with minced meat). Dinners are late relaxing meals, eaten slowly to savor the mouth-watering Mediterranean flavors. Cretan tap water is drinkable and served free of charge whenever you order coffee. If you specifically ask for water, you will likely receive bottled water and the establishment will bill you accordingly. The water is always served cool, but not cold, and rarely with ice. Bathrooms (or water closets) are not hard to come by. All bars and eating establishments have at least one. Gender-separate WCs sometimes share a common sink. As a rule, toilet tissue is disposed of in a trashcan and not flushed down the toilet to avoid clogging the narrow pipes. The bathrooms found in lodging facilities typically include a corner shower with a hand-held showerhead. The shower is open to the rest of the bathroom, which has a central drain. Everything in the bathroom is fair game for getting wet, so plan accordingly. Make sure the toilet tissue stays covered by its metallic holder or move it higher ground while showering. Towels usually wait outside the bathroom door. In the small villages of Crete, solar energy heats most of the water. Collection tanks and panels are commonplace on the flat rooftops. Bear in mind that hot (or more likely lukewarm) water is often only available in the evenings. If you count on a morning shower to wake you up, be prepared for a cold one! Delve a little deeper, stretch a little further. The best parts of the island are the undiscovered rituals of ordinary Cretan life. Jamie Winkelman, from Escondido, California, is an adventurous freelance writer with a passion for travel, food, and music. 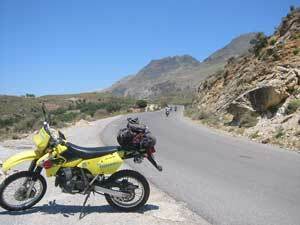 View Jamie Sue Winkelman's Photo Gallery of Motorcycling Across Crete.